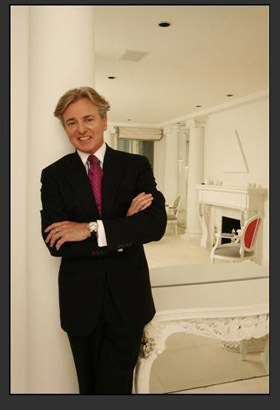 Design icon and South African born Geoffrey Bradfield specializes in creating opulent, elegant and serene interiors. His signature style is the use of Contemporary Art. “Functional Opulence” is the key to his designs, which draw inspiration from the Orient, African Primitivism, and Art Deco. His work incorporates fine art and antiques with modern materials and high tech accessories, attaching the same sculptural value to utility objects as to important pieces of art. Geoffrey Bradfield’s projects list is impressive. Among this roster of projects is the major design overhaul of the Gertrude Vanderbilt Whitney estate in Old Westbury, Long Island and the restoration of the late King Hussein’s mansion in Maryland. The New York-based designer has received several times the coveted recognition by Architectural Digest in their “AD 100″ as one of the top designers in the world. Before the interview I read that Geoffrey Bradfield is funny, sophisticated and down to Earth. I agree with this. Enjoy the conversation. I sure did! If in two words: “Functional opulence.” Having said that, I am a Modernist and the use of Contemporary Art is a significant ingredient in my signature style. When you were a child and grew up on a South African farm, did you want to become a designer? I never doubted my choice of career. I never experienced a Saul of Tarsus conversion on the way to Damascus. I always knew intuitively what I wanted to do. My first major assignment was in Johannesburg. I did the apartment of the Impresario, Pieter Toerien. He was my first celebrity client – I was 23 years old and it garnered me a lot of attention. Of course, everything is relative and I was swimming in a very small pond. Past would be Le Corbousier, whom I consider to be the most important influence on my early career. Latterly, I have been very inspired by the world of artists. Great artists have always influenced and inspired my work. I admire their ability to look at the world from fresh and daring perspectives. I love the creative process. The lot of an artist can be rather fleeting at times. It’s not a bad fate, as long as you are what you have created. If one’s work has resonance, it will outlive us. When I look at your interiors I see opulent spaces but I also feel a sense of serenity. How do you achieve this? I seek serenity in all my interiors. In addition to a disciplined and edited color palette, I think that art brings a lot of that signature to it. I mean we’re not talking great Picassos that are representing the Spanish wars, but art really can introduce a serene presence. To some extent, the Art Moderne period of the 1940s. But, it does go far beyond that. I am 90% visual. My visual curiosity and photographic recall affords me an endless inventory of rich ideas to draw on. I am also very intrigued with the advent of technology. There are many things every home must have, but in the end, I think we all agree the basic requirement is probably comfort. I identify with Billy Baldwin’s quote in the New York Times toward the end of his life: “lately I have been thinking how comfort is perhaps the ultimate luxury.” I believe this says it all. Success is so relative. Any designer who is passionate about what he does and has a strong point of view is mindful of creating a legacy. But when one has been fortunate enough to be recognized for one’s work, you like to feel not only that you are leaving a footprint, but also that you are giving back. You have to be able to sell yourself and your talent. It’s amazing how important a personality is. I also value honesty and frankness in an interview. I never intentionally hire down… I like to be challenged by my team. My signature Design Element question – what are the most important design elements? So inspiring to read the interviews you write, very nice. His designs are stunning! I enjoyed the interview! I love him! That orange room is delicious:-). Great interview too! His answer to your question “What does success mean to you? ” is incredibly impressive! What a luxury world it is !! Bradfield style is so chic and luxurious. Functional opulence – love it!! What a talent! I love that he added joy to his list of signature design elements. It really does shine through and the lucite furniture with gray and white is so my aesthetic–everything thought I was crazy for doing this in my house, but I love airy and elegant feeling it creates yet still feels comfy. My favorite interview so far! WOW, his work is amazing! That bedroom is to die for! I enjoyed this interview (and all your interviews). I really like these interiors –they’re beautiful. Jeffrey is a master at creating that certain ambiance…. Great interview! I love the art on the walls! Oh, I love this gentleman’s work — it’s always fearless, decadent and daring. MAYBE THE NEED FOR COMFORT COMES AFTER THE AGE OR “40″? 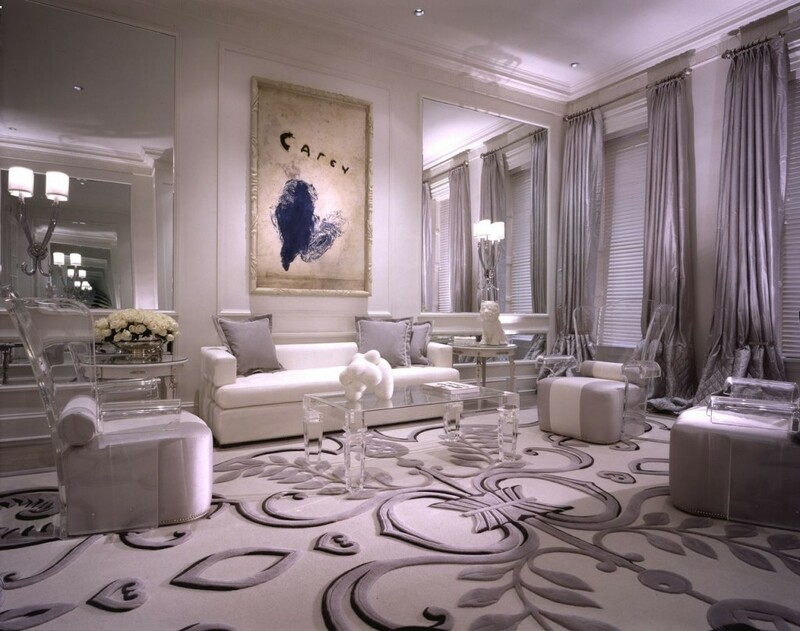 What a fabulous interview; that carpet with the larger than life damask pattern is so perfect. It’s amazing! Loved hearing more about him and his design process. Thanks for sharing this great interview! I love the great use of wall space in the first photo. Great designs created excellent:) also congratulations on your Margaret River giveaway you will love the wine. Scale and balance… very good point. Great choice of books, I have heard about “Home: A Short History of an Idea” so many times… I have to read it finally. I didn’t know his work but I am so glad I do know.. He is so smart and inspirational! Your interviews are so great!!! I always enjoy your interviews and I like this one in a special way. I’m not sure why, but it feels even more natural and I like that! I’m so glad to have your comments back on my blog! Thank you for that, my friend! maria — thanks for the visit at FatScribe. your blog has such great design, and i really enjoy your interview posts as well! i’ll be visiting often! – Jg. Don’t forget to stop by my blog before tomorrow as we will announce the winner of the $100 Lowe’s gift card! The rug looks amazing sort of 3D-ish. Thanks for the visit at LiveYourStyle! I look forward to reading your blog, it looks absolutely lovely. The lucite furniture in the lounge is very glamorous. Hi Maria, love your blog so inspiring do u have a twitter account to follow you? Totally my kind of guy! Thaqnks for sharing this interesting interwiev. Feel there´s a lot to learn from the great and successful ones! AMAZING!!! his work is so beautiful. great interview. It is good that we can take the loan and this opens up new chances. People in every country get the mortgage loans from different creditors, because this is comfortable and fast.